KIKIGOAL 5M Yoga Pilates Aerial Silk Kit Yoga Swing Aerial Yoga Antigravity Hammock Trapeze Silk Fabric for Yoga Strap Bodybuilding. Item Weight: 2.2 pounds. Size: 5x2.8m(LxW)&###x2F;16.4x9.2ft. Easy to assemble travel or indoors &###x2F; outdoors. Ideal for your home or yoga studio. 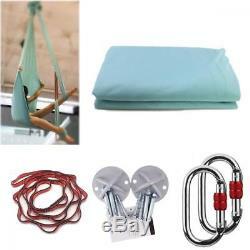 Package included1x Yoga Hammock(52.8m &###x2F;LW)2x carabiners for hanging2x daisy chains for extending(105cm1.5cm)2 x Steel anchors for ceiling8 x Mount screws. Note: there is two kinds of screws, one made for the wood beams of the ceiling, another made for concrete ceilings. 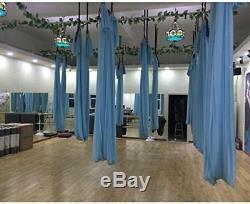 Deluxe aerial yoga hammock for all enthusiasts and professionals. Non-twisting hammock straps and smoothness of movement. Improve core strength, flexibility, full body balance, all while having some fun. What's the Benefits of Inversion? Allow the blood back of the head and relax the muscle. Back and Neck care and Weightless fitness. Strengthen the core and others muscles. Spinal decompression and pelvic traction. Can reduce fatigue, stress and relaxes the overall body. Helps reduce back stress by relieving pressure on vertebrae discs and ligament. Installed in the ceiling hook, fixed disk or can assume the pipe, two hooks spaced 50-80 cm better. Such as the need to install hooks on the ceiling perforated ceiling over the ceiling is not suitable for installation. (Installation must be able to load in a fixed object) 2. 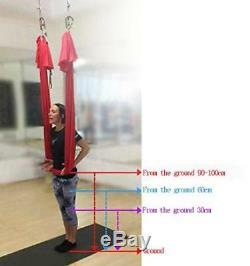 If the ceiling is high, and needs to extend the zone, extended with a length of 70 cm, anti-gravity yoga length from 1.4 to 1.5 meters, so it also can be used with high ceilings. The anti-gravity yoga mountaineering ends with the end of the hook to extend enough 4. There is two kinds of screws, one made for the wood beams of the ceiling, another made for concrete ceilings. Yoga hammock hanging anchor must be strong, hanging upside down from the height of the first floor is not more than 15CM, to prevent accidentally fall injuries. 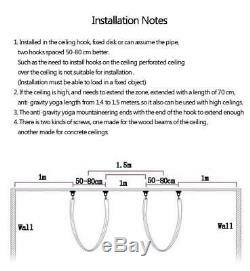 Please check before, yoga hammock hook plate is loose, extended belt for excessive wear. Avoid carry buttons or sharp objects are damaged and yoga hammock. This product is not fireproof fabric, please stay away from sources of ignition. Note yoga hammock clean the surrounding ground smooth, avoiding choose gravel, twigs and other sharp hard object exists locations. Package included 1x 5m Yoga Hammock. 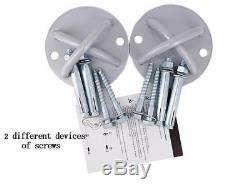 2x carabiners for hanging 2x daisy chain for extending 2 x Steel anchors 8 x Mount screws. The item "KIKIGOAL 5M Yoga Pilates Aerial Silk Kit Swing Antigravity Hammock Trapeze" is in sale since Wednesday, April 18, 2018. 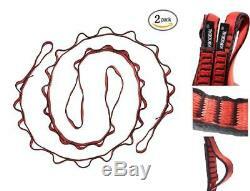 This item is in the category "Sporting Goods\Fitness, Running & Yoga\Yoga & Pilates\Yoga Straps".